Bonita Springs Real Estate,Bonita Springs Florida Homes For Sale as well as Condos and Condominiums in Southwest Fl. Lee Collier Realty Group Inc has provided Bonita Springs Real Esate services since 1996. We have provided realty services for thousands of interested buyers and sellers of Bonita Springs homes, and Bonita Springs condos. The town of Bonita Springs is only 20 minutes from the Southwest Floirda International Airport with daily flights from around the world. Easy access to the Airport alllows you to leave your state at Breakfeast and enjoy lunch on Bonita Beach. Bonita Springs real estate in Southwest Florida has exploded over the past 10 years with dozens of Bonita Springs new home communities and golf course properties being built. Several of the popular Bonita golf developments include: Bonita Bay, Pelican Landing,The Brooks, Palmira, Quail West, and Hunters Ridge, Spanish Wells and Worthington. Bonita Beach Florida is that area of Bonita Springs were you will find beachfront condos and luxury single family homes for sale as well some of the best beaches in the US. Many properties are located in new home communites or developments and less in general neighborhoods. Therefore having the right real estate agent that knows the details of each community is vital to making the right choices. Many Bonita Springs communities offer golf courses with a varity of skill levels and that is why it is important to select on of our knowledgeable associates. MUST SEE! Priced to sell! Great investment property! Home on the golf course 7th hole. PRIME LOCATION! Spanish Wells Golf Club, Bonita Springs Road, 3 miles from t ... More . It couldn't be easier to find your little piece of paradise of Spanish Wells! This 3 bedroom, 2 bathroom home is offered Turnkey - just bring your suitcase and toothb ... More . This Awesome Popular Tifton Model Home can be Yours! As you enter the foyer you instantly observe the open floor plan, extended great room, kitchen with island plus a ... More . Best price/sqft! Gorgeous 2 Story Pool house in a gated community just few miles distance from beautiful Bonita Springs and Naples Beaches! This home feature 4 large ... More . Come discover this hidden treasure! Placed on a generous lot, this three bedroom, two bath spilt floor plan home offers high vaulted ceiling through the main living a ... More . Gulf Access, well maintained 3/2, 2+ car garage with open floor plan built in 2003. Home features tile throughout, split bedrooms, formal dining room, breakfast room, ... More . Awesome home opportunity with extended living space! Freshly painted and ready for immediate occupancy. Oakmont model Take a peek and consider the perfect exposure.. ... More . H.14166 - Rarely available extended Oakmont situated on an oversized lot. The tiled entry portico is screened to let you enjoy the tropical breezes we are so famous ... More . New construction. This Nantucket home has a covered entry, a spacious master bedroom and one additional bedroom, a den/optional third bedroom, 2 bath, the open kitche ... More . H.14450 -This home is situated on the coveted oversized hammerhead corner homesite with additional parking space. This southern exposure home has wraparound water vie ... More . Welcome to paradise. This beautiful turnkey one bedroom beachfront condo has a spectacular view of the gulf and the beachfront community grounds of Seascape. Seascape ... More . H.13861 - Beautiful 4 Bedroom, 3 bath, second floor end unit in highly desirable Palmira Golf and Country Club. Overlooking a lake and 3rd fairway of the Osprey Golf ... More . 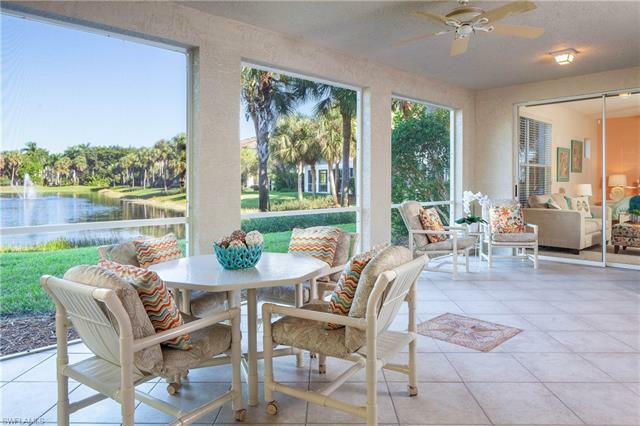 Rarely available first floor end coach home in Sandpiper Isle in Pelican Landing. This desirable home has it all: A fantastic lake view with three fountains, Its li ... More . This third-floor home features two bedrooms, two-and-a-half baths and over 1,900 square feet of living area. Features include tile throughout with the exception of th ... More . Wide open Bay views from every living area in this open-concept sundrenched condo with fully renovated kitchen. Located in North Naples/Collier County, its only a sho ... More . Enjoy this 2 bedroom plus den condo in the prestigious community of Bonita Bay. This condo is on the end and provides a light and bright space with an open floor plan ... More . C.16074 - A coastal tree top get away with expansive long lake views designed to provide privacy. Overlooking a nature trail just waiting to be explored. This attract ... More . Seller motivated! Relocation Sale!!! Move in condition!!! Your golfers dream becomes reality! Golf membership included! This magnificently appointed, affordable, 3 be ... More . Florence Model first floor Golf Included Coach Home located on Hole #9 of the Gordon Lewis 18 Hole Bonita National Championship Golf Course...Excellent Golf Course vi ... More . Location, Location, Location, GOLF! This Florence model coach home includes unlimited golf all year round. This quiet and spacious 1st-floor residence boasts spectacu ... More . If you are considering homes or condos that are Bonita Springs Foreclosures then select the highlighted link and it will take you to our sister site www.bonitasprings-foreclosures.com.